Patrick Buchanan: Are We Nearing a Civil War? So, are we nearing a Civil War? Was the last one not enough to suffice? All I have to say is if we are, I need to know how many times does it take getting hit by their purse before we can justify lethal force against the liberal wielding the purse? Of course I’m just kidding. I know they wouldn’t use purses. Not when they have their “safe places” to run to. 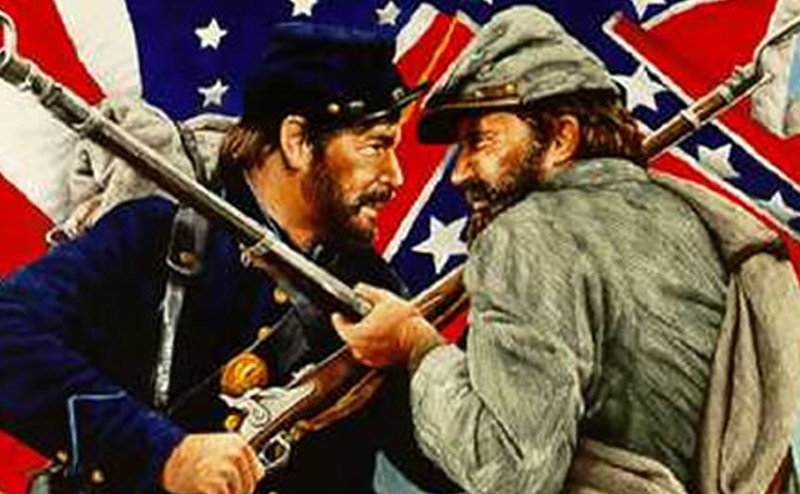 It would be a Civil War like none before it…because one side has all the guns, while the other wields pepper spray. It would be one and done. Am I awful to joke about this? Maybe. But here’s the thing, if I don’t joke about it…I might actually throat punch someone. Why? Well, because we have three sides at play here, but only two will suffer at the hands of the utter anguish Civil War will bring to a nation. We have the right and the left…both believe opposite of the other, but despite this, if it weren’t for the THIRD side involved they would still get along. What third side am I talking about? They are the underlying silent evil. They are those people that neither care or believe in anything being worth taking a stand for. They are the ones that just want chaos and corruption to run rampant so they can pick and pull from the spoils that are laid wasted from the commotion between two sides that have been fooled into believing that the other was wicked enough to kill and feel guiltless about it. Here’s a visualization for you, to hopefully help you understand what I am talking about. The third side takes a box and puts it in-between the right and the left….telling each side that in that box there is something that belongs to them. Something that is only theirs and it is of such importance to their very existence that it would be okay to lie, cheat, steal or kill to protect it from the other side. So, that is what the right and the left do…they fight, without seeking any common ground to start communication on. All communication is cut off, lies are told, lies are believed. Hate is spread under the false pretense that it is not hate but righteous indignation. Then comes all out war over this box. While the two argue and argue over this box of “important substance,” the third side takes advantage of their focus on the box and takes what they want, right in the plain sight of the very people they are stealing from. The people who are now blinded by hate. There was never anything in the box. The third side has fooled them all and while they fought over nothing, the third side has also taken over what once was precious and protected by the left and the right. Things like freedom, liberty, justice, safety and the pursuit of happiness. I joke about Civil War because if I don’t I will be unable to withstand my utter disgust in the idea. Civil war, killing our own…and why? Because of an empty box. While the third side from other countries of the world that want to hurt us, get their day in the sun. Well folks, according to what you are about to read, this made up story might have a chance at becoming our reality. Thus far, it is a nonviolent struggle, though street clashes between pro- and anti-Trump forces are increasingly marked by fistfights and brawls. Police are having difficulty keeping people apart. A few have been arrested carrying concealed weapons. That the objective of this city is to bring Trump down via a deep state-media coup is no secret. Few deny it. Last week, fired Director of the FBI James Comey, a successor to J. Edgar Hoover, admitted under oath that he used a cutout to leak to The New York Times an Oval Office conversation with the president. Goal: have the Times story trigger the appointment of a special prosecutor to bring down the president. Comey wanted a special prosecutor to target Trump, despite his knowledge, from his own FBI investigation, that Trump was innocent of the pervasive charge that he colluded with the Kremlin in the hacking of the DNC. Comey’s deceit was designed to enlist the police powers of the state to bring down his president. And it worked. For the special counsel named, with broad powers to pursue Trump, is Comey’s friend and predecessor at the FBI, Robert Mueller. Here we go folks…the corruption has run so deep that those who created it in the first place can’t even tell truth from lies now, but that’s okay because they don’t care about the truth. They just want us to stay focused on the empty box long enough to get theirs.